I love this product. 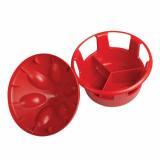 You can separate three different kinds of grit, oyster shell, or whatever in it, by using the removable insert. 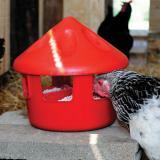 The cap protects it from the rain and the high sides keep it clean, while still allowing the chickens easy access. 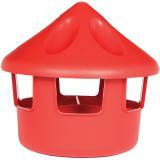 The shape of the top prevents the poultry from perching on top. It is durable. This seems to work well for my 28 layers. It cut WAY down on waste. I elevated it on two large wood blocks to keep it out of the bedding and at the hens' height. I use one section for grit and the other two sections for oyster shells. To help the hens discover it, I sprinkled oats on top of the oyster shell/grit inside (with them watching). That encouraged them to put their heads inside and discover what was in it. I do like this product. The only change I would make would be to make it to hang. 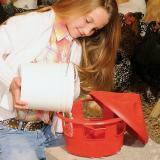 Chickens load it up with bedding when they are scratching.